For more information on how we can help you, please visit the software development services. Gooberry is a stock quote and search engine system delivered by email. 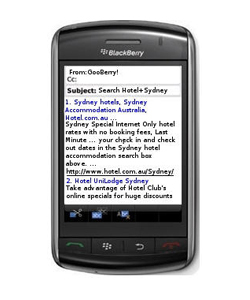 Originally designed for the Blackberry mobile phone it was expanded to included regular email clients. After our initial discussion with Fabio Di Giorgi, the owner of Gooberry, we quickly came up with a specification that provided him with a clear outline on our strategy, implementation and functionality provided with the software project. A Windows Service was developed that was responsible for listening to an email queue for requests, reading and interpreting the subject line of the email and replying to the sender with a response (e.g. stock quote, search engine results). The system also provided notification to the administrator in the event of any outage, error or problems. Our strong investment in CodeSmith Library Templates have allowed us to produce fully tested, perfectly formatted, robust and extremely reliable code for our web development projects. By analysing a database using its key properties, the software automatically generates between 60-75% of all the code required for our web applications using an enterprise framework and expert implementation. A complete suite of code generation libraries were developed that reduced development time by many magnitudes of order and increased profit margin by up to 200%. By analysing the content and internal structure of the database, a basic web framework including stored procedures, business objects, data access layer, web controls and the Content Management System could be automatically generated. This allowed for a more intensive focus on enhancing the interface design for customers and providing an improved user experience for website visitors. Maintenance costs and defect levels were reduced by 50% by generating proven, robust and thoroughly tested code. Reduced time to market also provided a strong competitive advantage and great reviews for company! A comprehensive, object oriented, common library was developed that significantly reduced development time for all web projects by up to 20%. The time savings gained were then passed on to customers in the form of reduced costs and helped the company to improve its competiveness as well as enhance sales opportunities.